The brunette beauty is wearing a black top and jeans, flat black ballet pumps and a cropped white blazer. She also matches her outfit with small Lottie bag and an engagement ring. She is tapping out a message on her phone as she walks towards an errand. 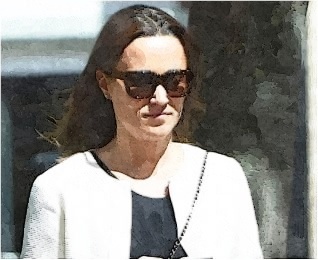 Meanwhile, a report suggests that the younger sister of Duchess Kate enjoyed a rich honeymoon in French Polynesia with her husband James Matthews after their posh countryside wedding. She also attended another wedding in Stockholm and appeared at Wimbledon event in June.